Dean Sink (center) with newest members of Mickey’s 40-Year Club, from left: Reggie Horne, Debbie Deal and Rocky Barham. 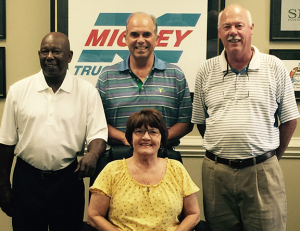 Reggie Horne (Quality) Debbie Deal (Sales) and Rocky Barham (Parts) joined Mickey Truck Bodies’ exclusive 40-Year Club earlier this year, marking their four decades of service to the company. The only other active 40-year veteran at Mickey is Willie Brown (Scheduling), with 42 years. Mickey Truck Bodies has long been recognized for its outstanding employee service records. Over 20% of Mickey’s total workforce of 400-plus teammates have been with the company for at least 15 years, including 15 who have logged 30 or more years of Mickey service. More than 40% of all team members have been with the company for at least 5 years as of the beginning of 2017.